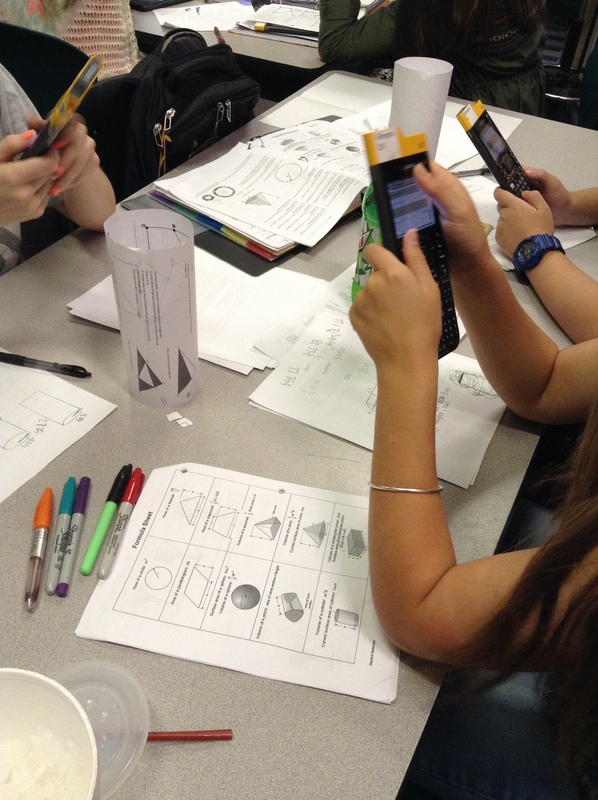 I have been invited to write a few posts for NCTM’s Mathematics Teacher Blog: Joy and Inspiration in the Mathematics Classroom. You can read my second post here. While you’re there, be sure to catch up on any other posts you haven’t read. There are some great ones by Matt Enlow, Chris Harrow, and Kathy Erickson. 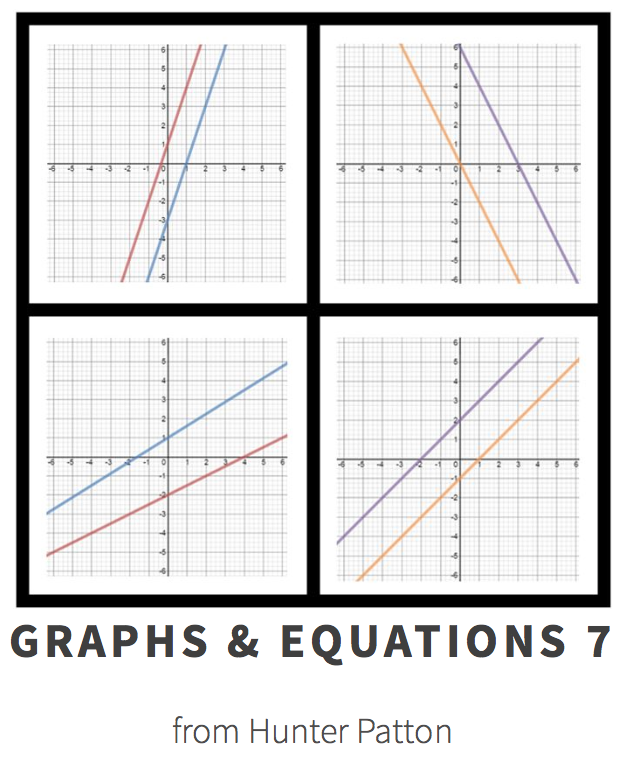 My post starts with a quote by one of my students: A few weeks ago, I overheard one student telling another, “Will you help me figure this out? Don’t just tell me how to do it.” How many of the students in our care are thinking the same thing? How often do we tell them how to do mathematics? How often do we provide them with “Ask, Don’t Tell” opportunities to learn mathematics? @jwilson828 love that opening quote. Culture created! John had no idea that I happen to be reading Creating Cultures of Thinking by Ron Ritchart (you can preview the first chapter at the link), and so the language that he chose to use was timely. I’m deep in the midst of thinking about how we teach our students to learn … about the cultures that we are creating with our students. 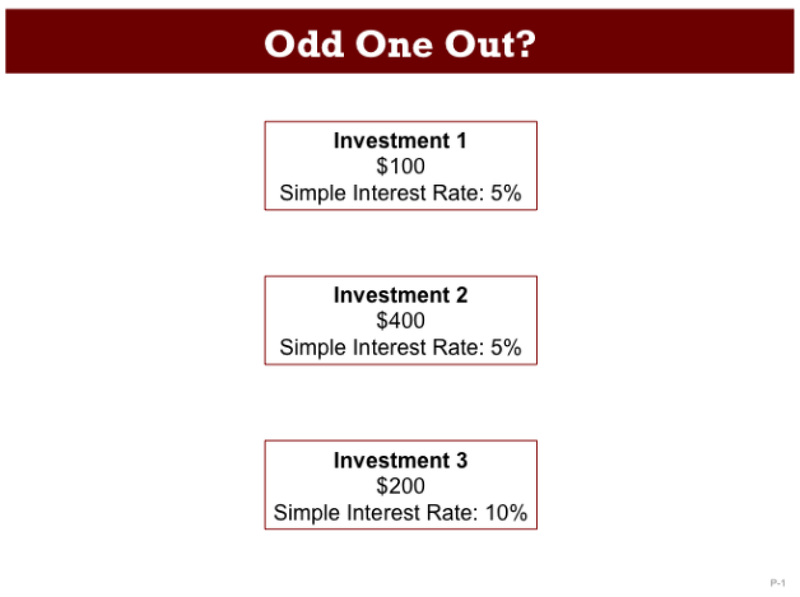 You’ve seen “which one is different” before. You’ve seen “Odd One Out” before. 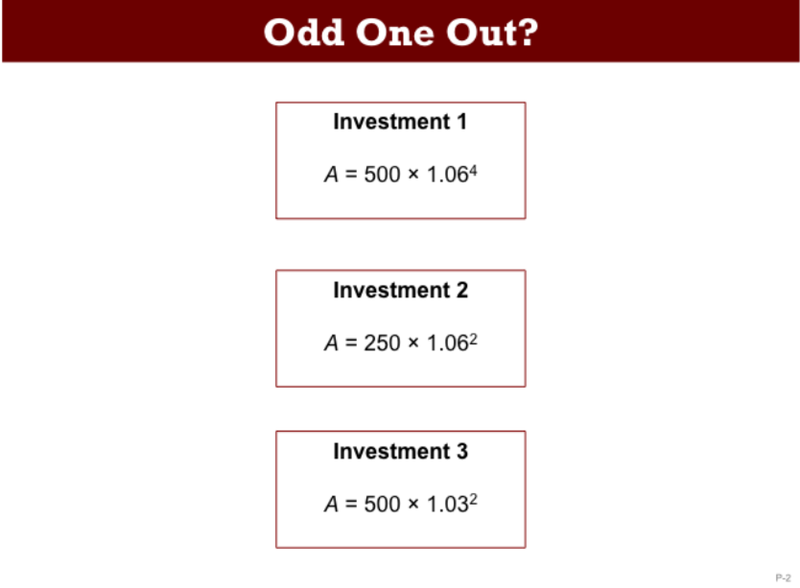 These two images come from the Mathematics Assessment Project formative assessment lesson on Comparing Investments. When I recently learned about Mary’s Which One Doesn’t Belong site, I decided to spend some time on it during our recent Math PLC meeting. 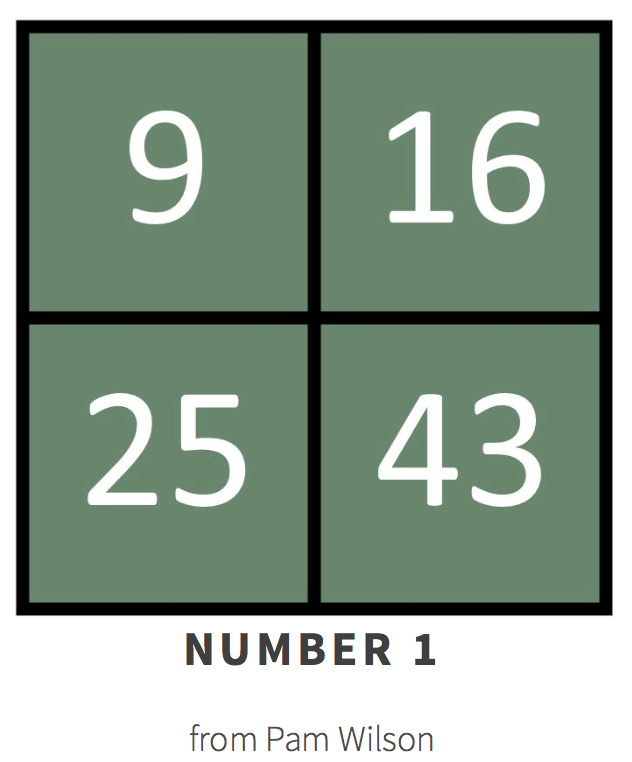 We did a number WODB (one teacher fist-pumped another assistant principal when they figured out that 9 didn’t belong since the sum of its digits isn’t 7). Thanks, Pam! 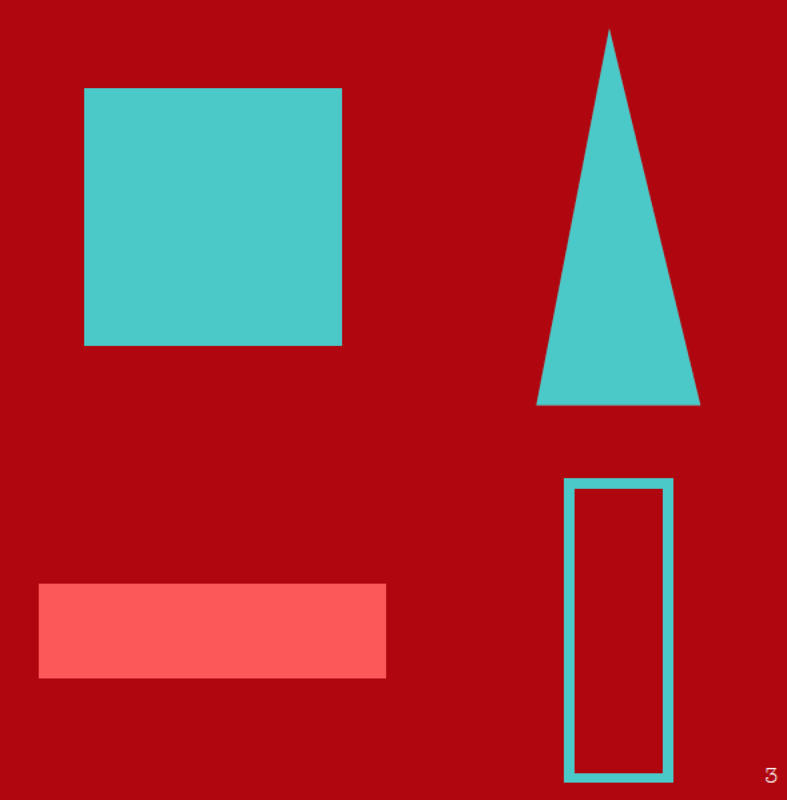 Then we moved to Rachel Fruin’s geometry Which One Doesn’t Belong. Our history teacher-turned assistant principal was still able to participate. She didn’t have the same vocabulary that the rest of the math teachers in our department had when stating why one doesn’t belong, but she learned some math vocabulary and we learned to see the images through different eyes during our shared experience. We ended our PLC with Hunter Patton’s Graphs & Equations 7. I recently heard that one measure of the success of professional development is whether the teacher’s practice changes as a result of what was learned. (Another part to this would of course be how long the teacher’s practice changes … one lesson? A few lessons? Or permanent change in lessons?) 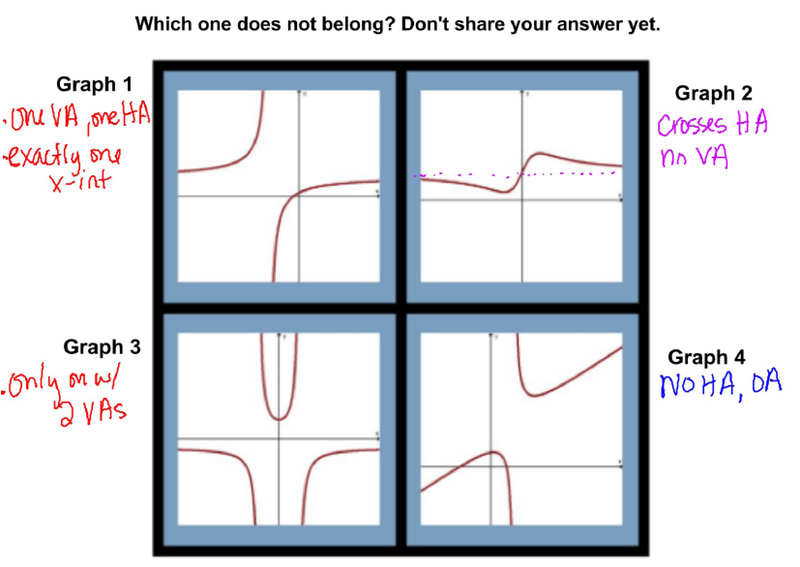 So I was thrilled to notice that the teacher with whom I share a room gave her precalculus students a WODB to try at the end of their opener later that day. They were studying rational functions. Which one doesn’t belong? 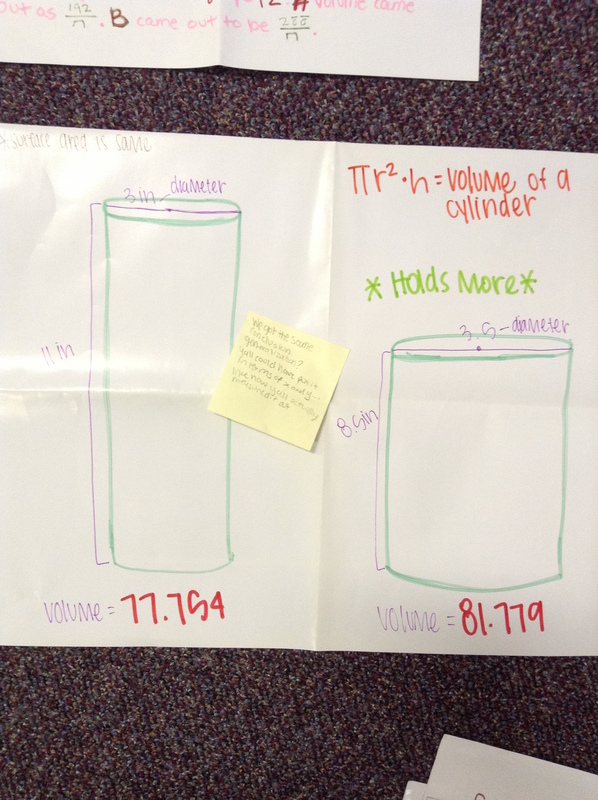 Before I knew it, students were in different corners of the room based on their initial responses. They shared thoughts with each other before sharing with the whole class. 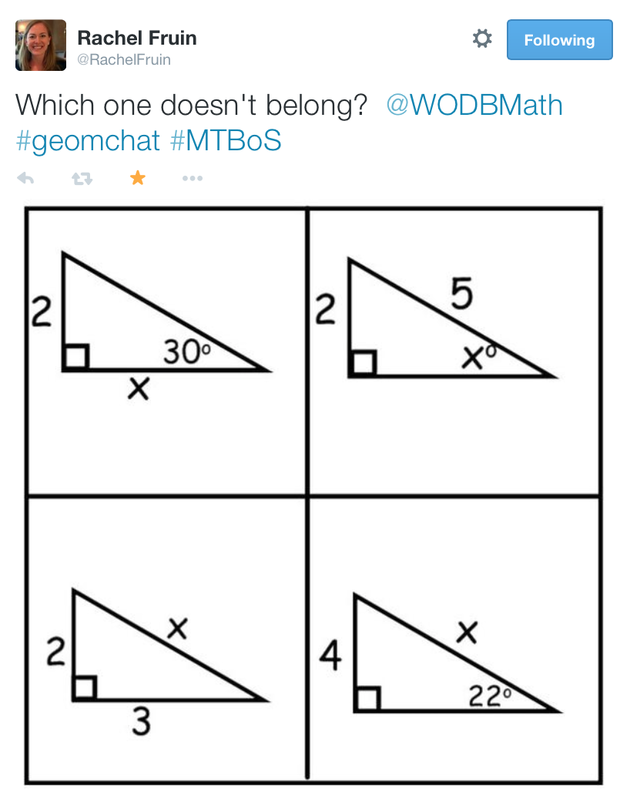 I tried the geometry WODB with my geometry students yesterday. I asked them to send me their response so that I could decide whether moving to one of the four corners of the room would be worthwhile. I asked bottom left to gather, bottom right to gather, and then top left & top right to gather. Why doesn’t your choice belong? Now work on your mathematical flexibility. Instead of being satisfied with one way to answer, find multiple responses. Find a reason that each one doesn’t belong, and let me know when you do by selecting that choice on the new Quick Poll (now multiple response). 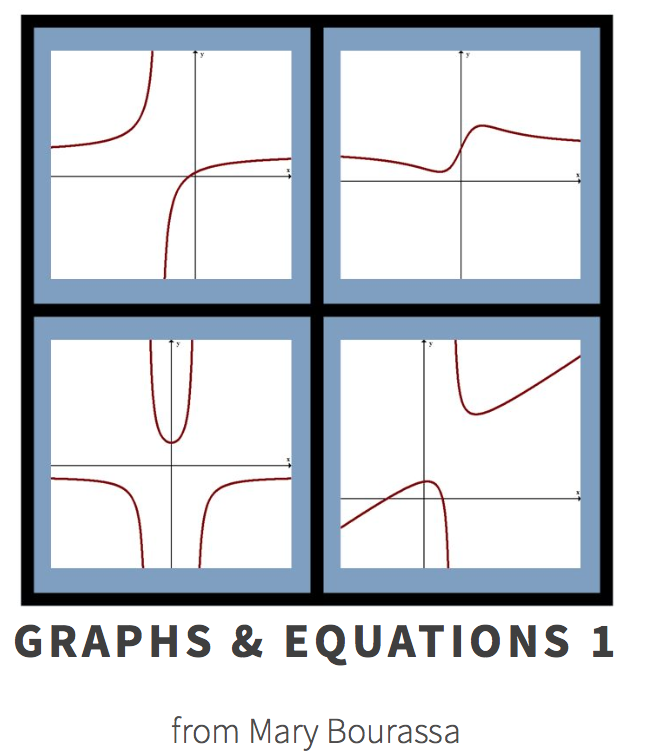 I’ve offered problem solving points for students who create their own WODB, and I look forward to seeing the results. Thank you, Mary, for creating a place for us to share and learn together … for creating a site that our teachers were able to immediately incorporate into their own learning and their students’ learning. 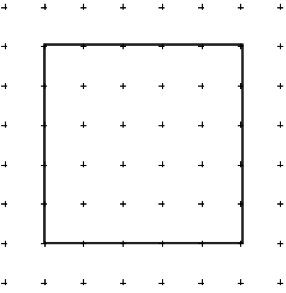 Sketch a smaller square inside the given square so that the area of the smaller square is half the area of the larger square. 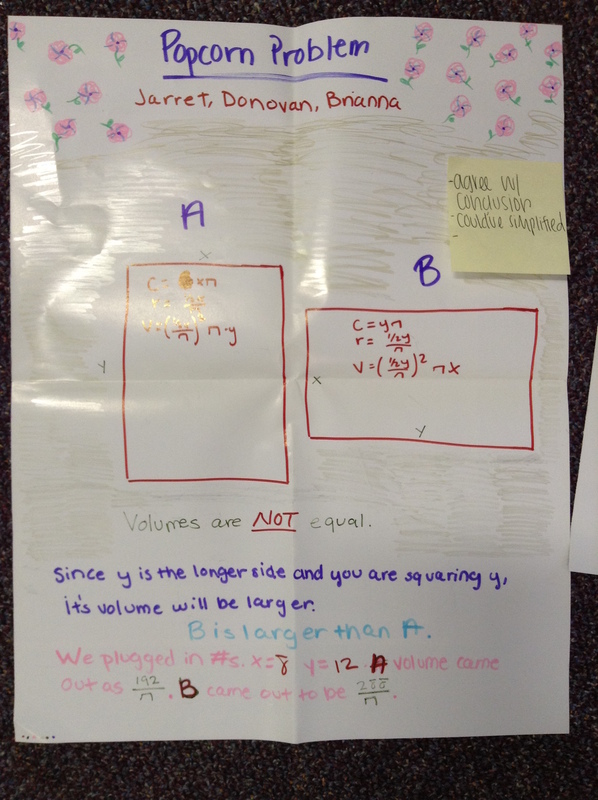 Write an explanation to convince another that your new, smaller square is truly half the area of the original square. 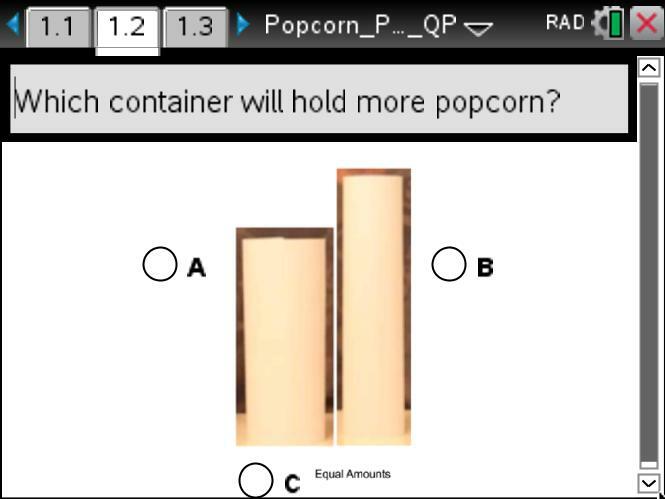 I’m sure that I didn’t write this question, but I don’t remember from where it came. 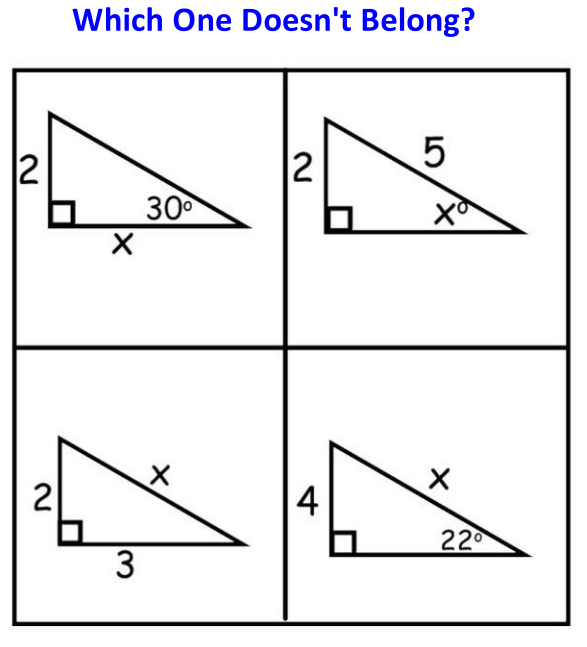 What would your students get right? 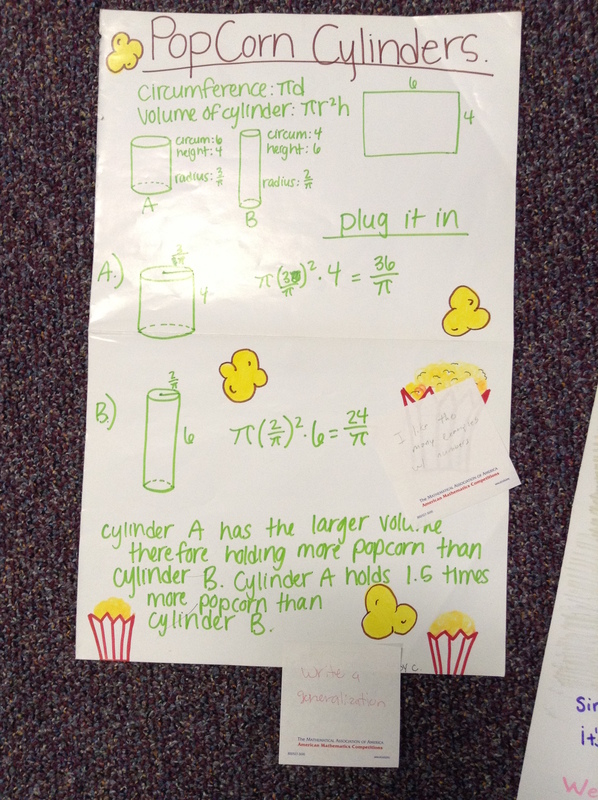 I was surprised at some of my students’ misconceptions (and miscalculations) and explanations. Calculation errors. Lots of “simple” calculation errors: Half of 36 is 16. Half of 25 is 13.25. Half of 5 is 3.5. And someone getting at the immeasurability of irrational numbers. I wrote recently about A-S-N-T-F. I also wrote recently about what happens when students don’t recognize that a statement and its converse are different. We explicitly worked on conditional statements after that lesson. 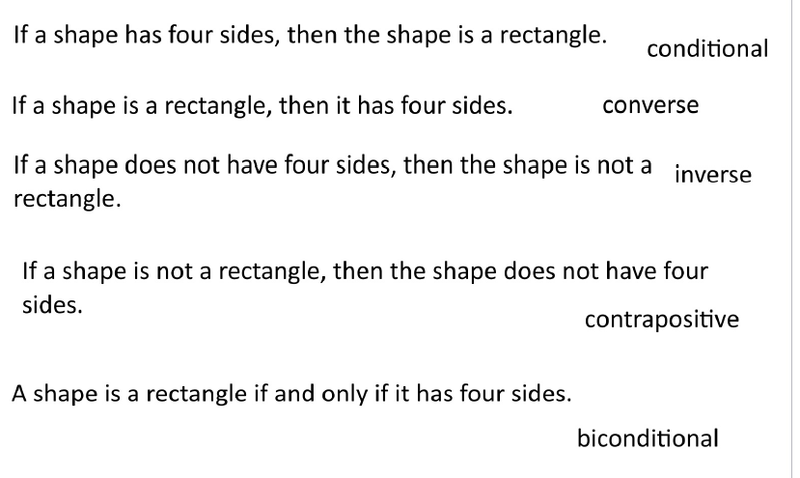 So we defined converse/inverse/contrapositive/biconditional using symbolic logic, and then students decided which was which for a given conditional statement: If a shape has four sides, then the shape is a rectangle. What happens when you change which statement is the conditional statement? Again, students figured out which was which using the “new” conditional. And then we were ready to start thinking about the truth value of the statements. Or maybe we weren’t ready actually ready, but we started thinking about the truth value anyway. I never click on the student results for a Quick Poll in front of the students for the first time. My projector remote is an extension of my hand (except when I’ve carelessly laid it down and can’t find it), and so while students are working, I freeze the screen to look at the results and decide whether to make an instructional adjustment and if so, what instructional adjustment to make before I show the results to the students. Sometimes (as is the case in the contrapositive QP above), I have time to go talk to students who have answered incorrectly to clear up misconceptions while other students are still working. 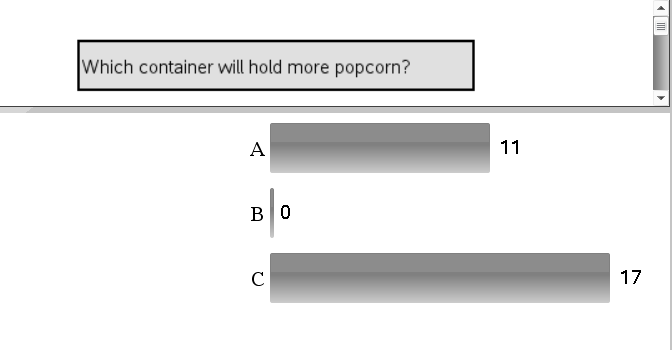 Sometimes (as is the case with this question), I deselect “Show Correct Answer” before displaying the results to students. I asked students to find someone in the room at a different table who answered differently. Convince them you are correct. Then let them convince you they are correct. (Practice construct a viable argument and critique the reasoning of others.) 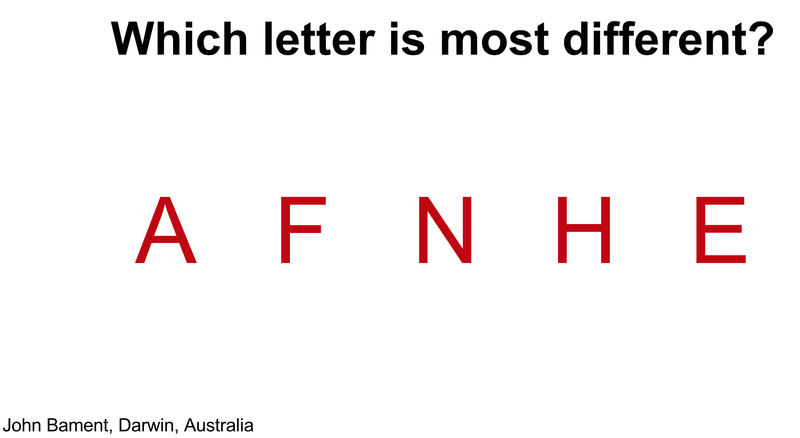 Then send in your answer again. Sometimes the responses change to 100% correct. Sometimes they don’t. And so I have to decide my next instructional adjustment. Do we have time to try this again? Or is the clock ticking more quickly? 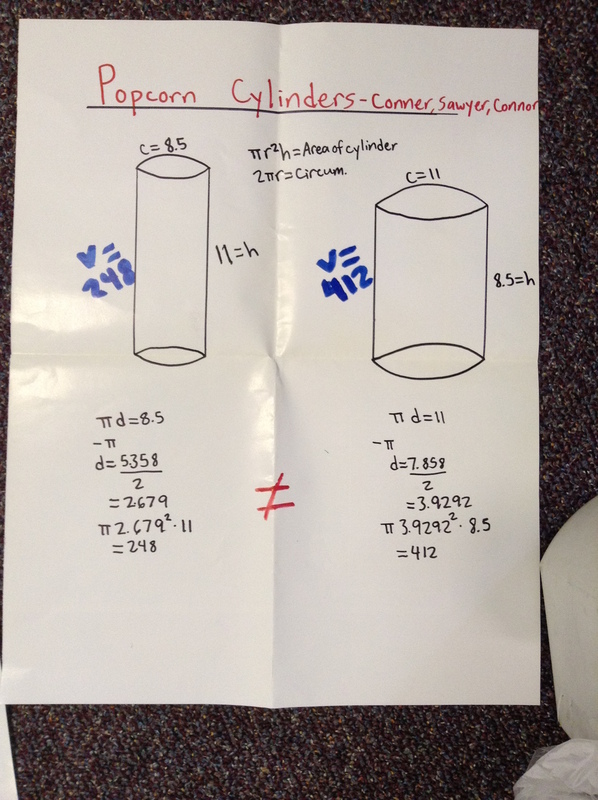 My decision this time was to have a student come draw her counterexample. 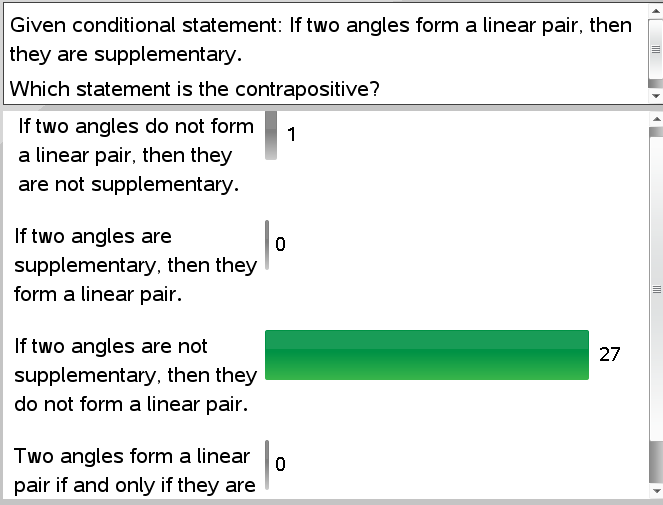 What do we mean when we say two angles are supplementary? Does that counterexample convince those who say the statement is true? What if we are evaluating whether this statement is A-S-N? And so the journey continues, grateful for technology that gives every student in my classroom a voice – from the quietest to the loudest – so that I can make more informed decisions for when to make instructional adjustments. I’ve written about this exploration before, so I want to focus on what was different this year. 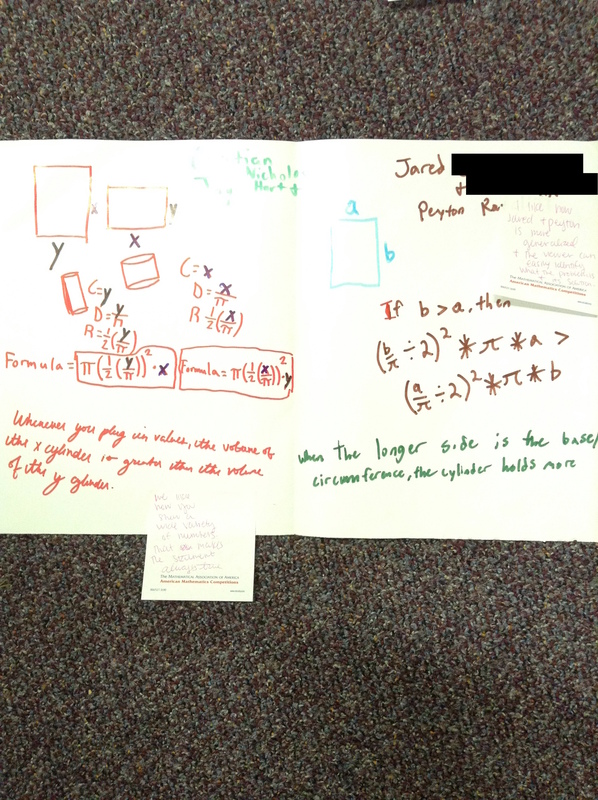 Students constructed viable arguments and critiqued the reasoning of others. We are learning how to attend to precision, so we were lenient in giving credit to responses for which the oral explanation helped us make sense of the written explanation. One team wrote that if you added something to Z and subtracted something from W, then the points would map onto one another. I wouldn’t have worded what they were trying to say like they did. But they were getting at some important mathematics. Ultimately, they were trying to convey that Z and W are the same distance from the origin. We constructed a circle with the origin as the center and Z as one of the points on the circle and noticed that both Z and W always lie on the circle. 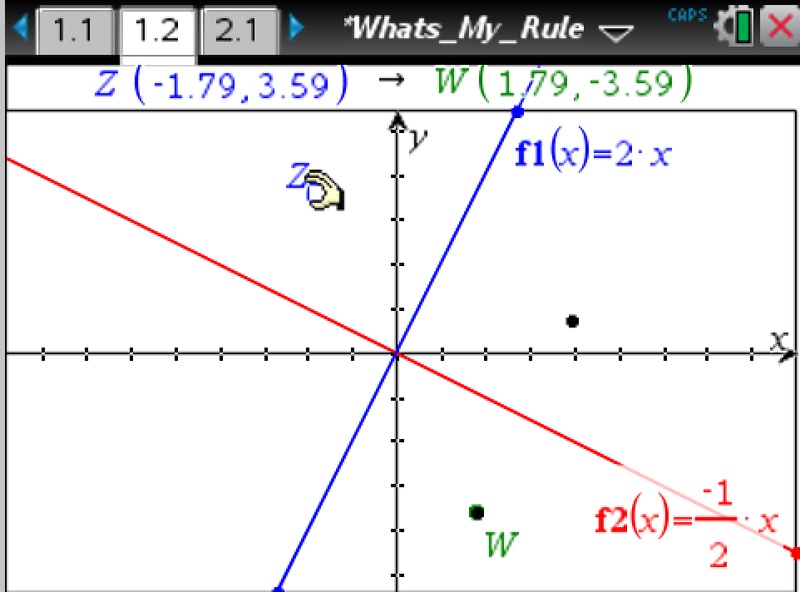 A few other students said that the rule was to reflect Z over the line y=x to get W. Does that always work? We looked back and decided it wasn’t always true. When is it true? When does (x,y)→(-x,-y) also represent a reflection about the line y=x? 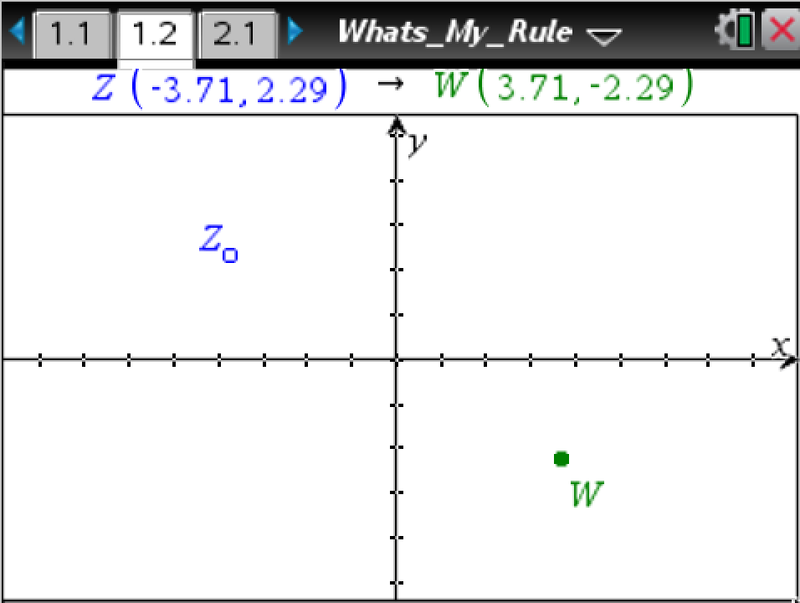 Others thought that the rule was to reflect Z over the line y=-x to get W. Does that always work? We looked back and decided it wasn’t always true. When is it true? When does (x,y)→(-x,-y) also represent a reflection about the line y=-x? 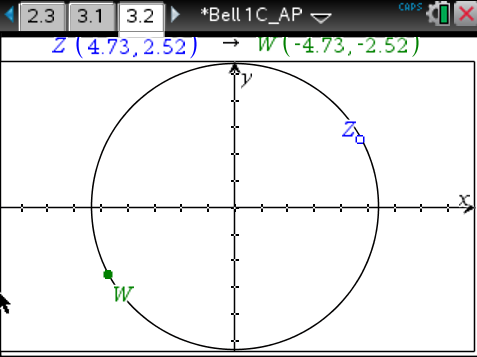 Other students noticed that we could describe the rule using a rotation of Z 180˚ about the origin. No one noticed that we could reflect Z about the x-axis and then about the y-axis. So what happens when no one notices something we want them to notice? I could have moved on. It wouldn’t have been detrimental to my students learning of mathematics if they didn’t know that. But I didn’t. Instead I asked whether there was a reflection that we could use to map Z onto W. I gave students just seconds to think alone and then time to talk with their teams. I monitored their team talk. 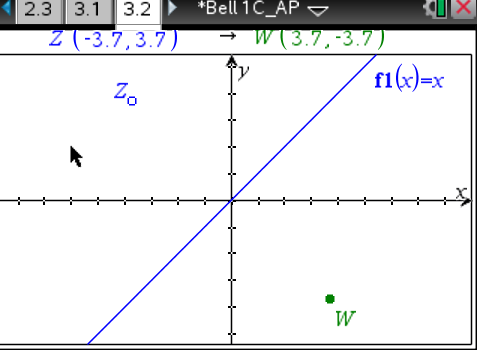 5 teams said that we could reflect Z about the perpendicular bisector of segment ZW to map Z onto W. Yes. Not what I was expecting … but absolutely true. 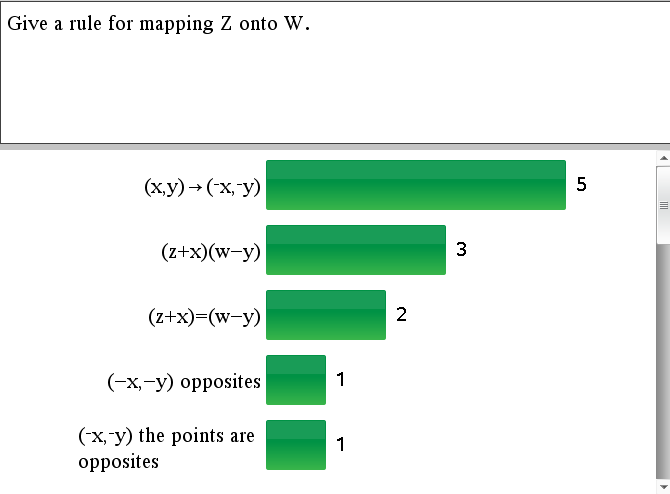 One team said that we could reflect Z about the line y=x and then about the line y=-x to map Z onto W. Oh…we can reflect Z about y=x and then y=-x? How can you show that? Is there another sequence of reflections that will map Z onto W? Reflecting about y=-x and then y=x. 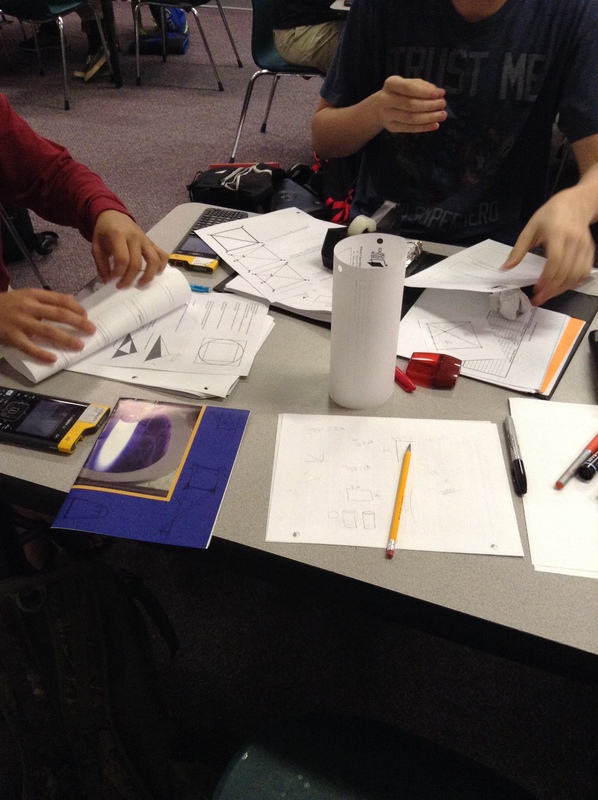 Teams worked together – and after another few minutes, they figure out that reflecting about y=0 and then x=0 would work. Or reflecting about x=0 and then y=0. And then we were called to the cafeteria for school pictures. 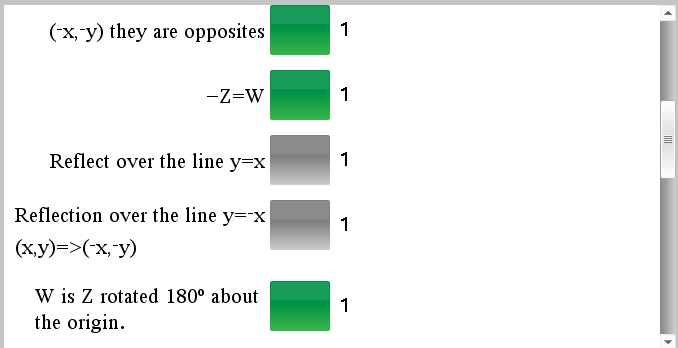 And then a student came up to me in the line for school pictures and asked whether there would be an infinite number of pairs of lines about which we could reflect Z onto W.
Are there an infinite number of pairs of lines that will work? 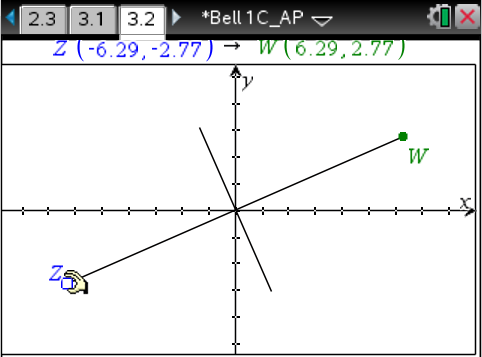 What relationship do the pairs of lines have that we found? 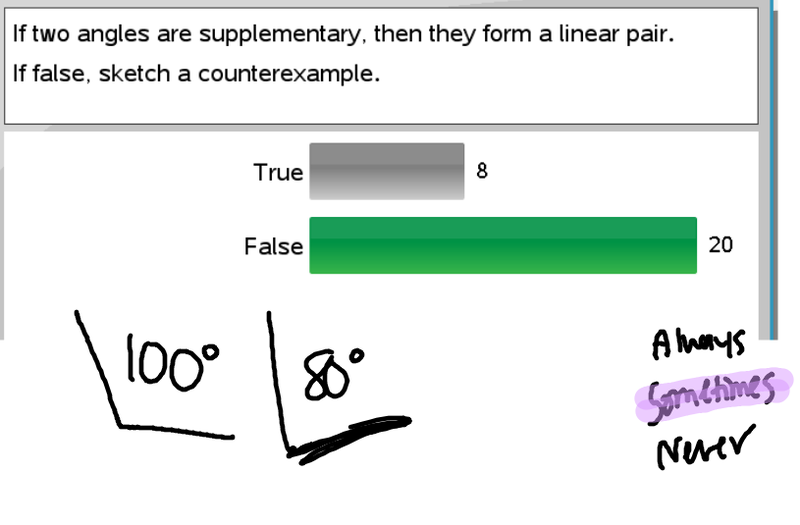 What is significant about the pairs of lines? After a few more questions, the students around us in line for pictures noted that the lines are perpendicular. 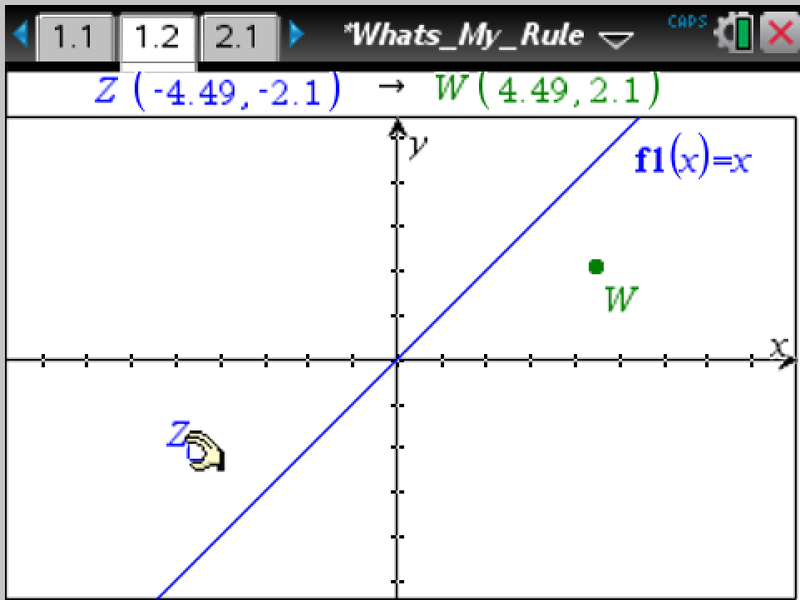 So if we reflected Z about y=2x, then about what other line would we need to reflect Z’ to get W? I will be the first to admit both that of course all of this makes sense mathematically, and also that I’ve never thought about it before. 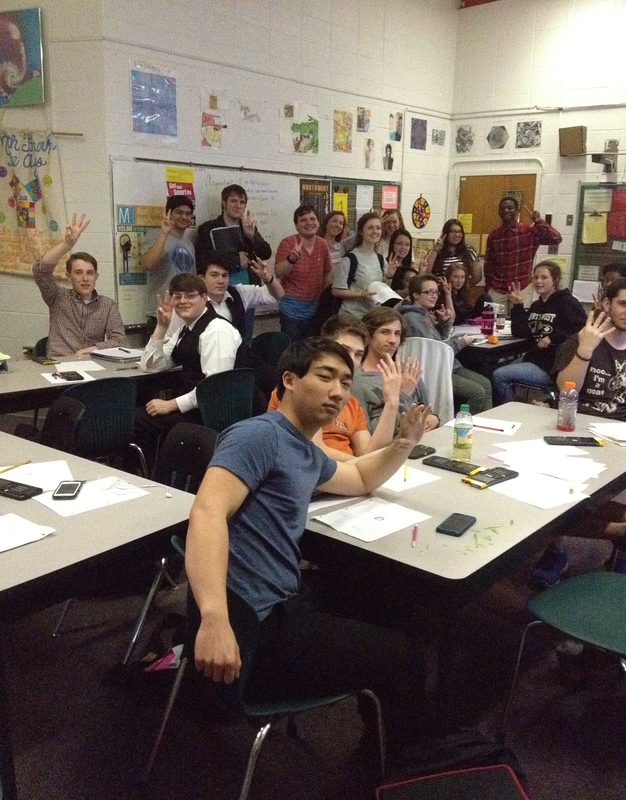 And so the journey continues … ever grateful for the students with whom I learn. Thanks to Michael Pershan for sharing Transformation Rules.